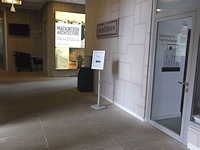 Services / facilities within the building include 2 galleries, Mackintosh House, lecture theatre, shop and Sculpture Courtyard. 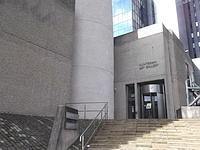 The name of the nearest underground station is Hillhead. 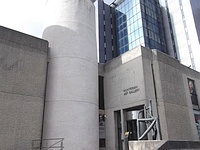 The Hunterian Art Gallery and Mackintosh House are located in Hillhead Street on the main campus. 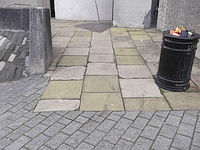 The dimensions of the Blue Badge parking bay(s) are 300cm x 450cm (9ft 10in x 14ft 9in). The nearest Blue Badge bay is 70m (76yd 1ft) from the main entrance. The furthest Blue Badge bay is 85m (92yd 2ft) from the main entrance. 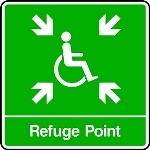 There are designated bays for disabled staff, students and visitors across the campus. 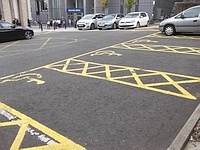 Please see the University of Glasgow parking notes for further details.The photograph shows the road outside the venue. The door opening is 80cm (2ft 7in) wide. 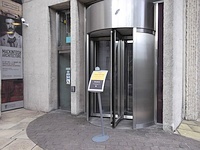 To the right of the automatic door there is a revolving door. The ramp or slope is located on the right as you face the entrance. 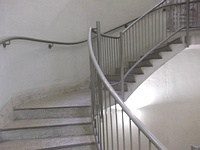 The steps are located leading up to the entrance. 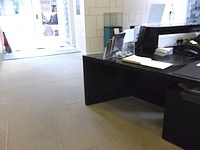 The desk is 5m (5yd 1ft) from the main entrance. The infrared hearing assistance system is located in the main Lecture Theatre. 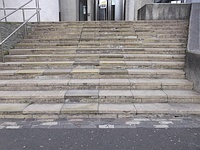 The floors which are accessible by stairs are Hunterian Art Gallery 1-2-3. Level 3 - Gallery 2. 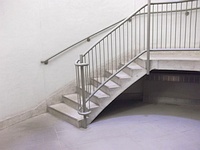 The floors which are accessible by stairs are Mackintosh House 1-2-3-4. 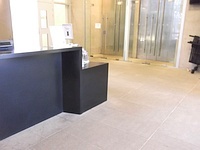 The services on the floors which are not accessible are exhibitions on level 2 to 4. You are on Lift (Hunterian Art Gallery). Skip to the next section. 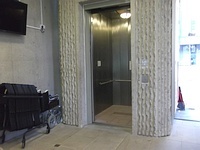 The lift is located just beyond reception on the right. 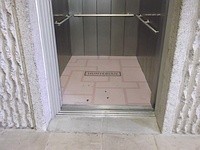 The floors which are accessible by this lift are 1-2-3. The lift is 9m (9yd 2ft) from the main entrance. The clear door width is 125cm (4ft 1in). The dimensions of the lift are 130cm x 200cm (4ft 3in x 6ft 7in). 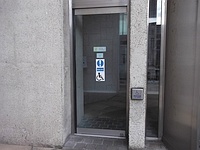 The accessible toilet is 15m (16yd 1ft) from the lift. 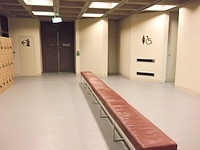 The accessible toilet is located within the standard male and female toilets. 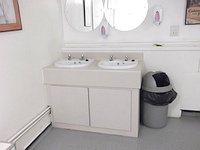 There are identical adapted toilets located within both the standard male and female toilets. 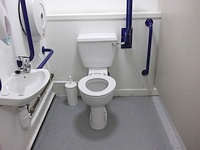 The width of the accessible toilet door is 90cm (2ft 11in). 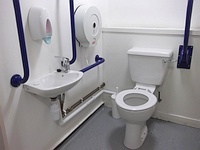 The dimensions of the accessible toilet are 150cm x 140cm (4ft 11in x 4ft 7in). No emergency alarm fitted in the cubicle. The female toilets are located on level 1, right as you exit the lift. The female toilets are 15m (16yd 1ft) from the lift. The male toilets are located on level 1, left as you exit the lift. The male toilets are 15m (16yd 1ft) from the accessible entrance. Disability awareness training is available for all staff through the Staff Development Service. Other training relating to specific areas of disability awareness, such as curriculum development or a specialised software package is provided from theLearning and Teaching Centre,IT Servicesand theStudent Disability Service.